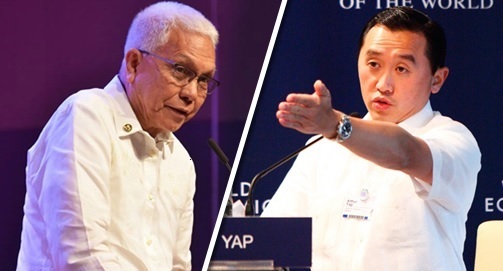 With the filing of the certificates of candidacies barely four weeks away, last termer Rep. Art Yap and Cabinet Secretary Leoncio Evasco, Jr. have emerged as most likely to run for governor during next year’s elections. Sec. Evasco was unofficially declared as PDP-Laban’s gubernatorial bet. During a press conference held last Thursday, Vice Gov. Dionisio Balite, claiming as the provincial party chairman categorically declared Evasco as their bet for governor while he also confirmed his decision to run for congressman in the third district. Balite likewise mentioned their district party chairmen, namely, Donald Sevilla for the first disrict, Boy Pernia for the second district and his son, Board Member Victor Balite for the third district. However, Balite’s authority of announcing the party’s probable bets was questioned by former Mayor Doloreich Dumaluan who said that there was no election conducted to change him as provincial PDP president. Without such authority on Balite, he could not announce such sensitive party statements. Meantime, on the part of the “Padayong Bol-anon”, the tandem of Yap and last termer Rep. Rene Relampagos surfaced amid claims that the two Bohol leaders will never clash to run for the same position. A highly placed source told the Chronicle it will be a Yap-Relampagos tandem. The party’s expected candidates for congressmen are last termer Gov. Edgar Chatto for the first district and retired Judge Fernando for the third district. The second district remains as the group’s set-back as they are still scouting for a candidate to run against re-electionist Rep. Aris Aumentado.